This new Handbook is a comprehensive examination of the rich and complex issues of nuclear proliferation in the early 21st century. The future of the decades-long effort to prevent the further spread of weapons of mass destruction is at a crossroads today. If international nonproliferation efforts are to be successful, an integrated, multi-tiered response will almost certainly be necessary. A serious, thorough, and clear-eyed examination of the range of threats, challenges, and opportunities facing the international community is a necessary first step. This Handbook, which presents the most up-to-date analysis and policy recommendations on these critical issues by recognized, leading scholars in the field, intends to provide such an examination. Part I presents detailed threat assessments of proliferation risks across the globe, including specific regions and countries. Part II explains the various tools developed by the international community to address these proliferation threats. Part III addresses the proliferation risks and political challenges arising from nuclear energy production, including potential proliferation by aspiring states and nonstate groups. 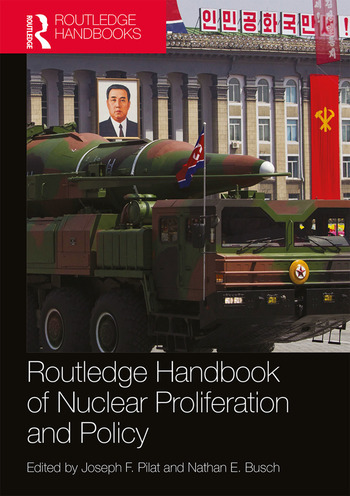 This Handbook will be of great interest to students and practitioners of nuclear proliferation, arms control, global governance, diplomacy, and global security and IR general. Joseph F. Pilat is Project Manager at the National Security Office, Los Alamos National Laboratory and a Global Fellow at the Woodrow Wilson International Center for Scholars, Washington, DC, USA. He is the editor of Atoms for Peace: A Future after Fifty Years? (2007). Nathan E. Busch is Professor of Government at Christopher Newport University (CNU), Virginia, USA, and Co-Director of CNU’s Center for American Studies. His is the co-author of The Business of Counterterrorism: Public–Private Partnerships in Homeland Security (2014).